What is the value of online sharing? What is the value of online recommendations? What is the value of a tweet or a Facebook comment? More importantly, how does this value impact my sales figures or conversion rates? Further questions; what do I look for in a brand’s online presence? Where do I go to increase my knowledge of a product before purchasing? What have people tweeted/commented about this brand? Where do I go to increase my knowledge of a product before purchasing? – Online recommendations (valuable). What have people tweeted about this brand? – Social opinion (valuable). If you can answer each of the initial questions with the premise of the below questions, then you have already proven to yourself that social proof is a necessary part of a brand’s online presence. For those who aren’t 100% sure what social proof is, it’s the power of influence and trust built up from our fellow peers. In this instance, we are talking about customers online. Think of it this way: you are about to purchase a brand new PS4 game, but aren’t sure you want it, your friend next to you tells you how good the game is, and that you definitely need it; it has helped, but you’re still not convinced, so you ring up your other friends, each of these say the game is awesome; you are now much more inclined to buy it, so you get your wallet out and pay the cashier. 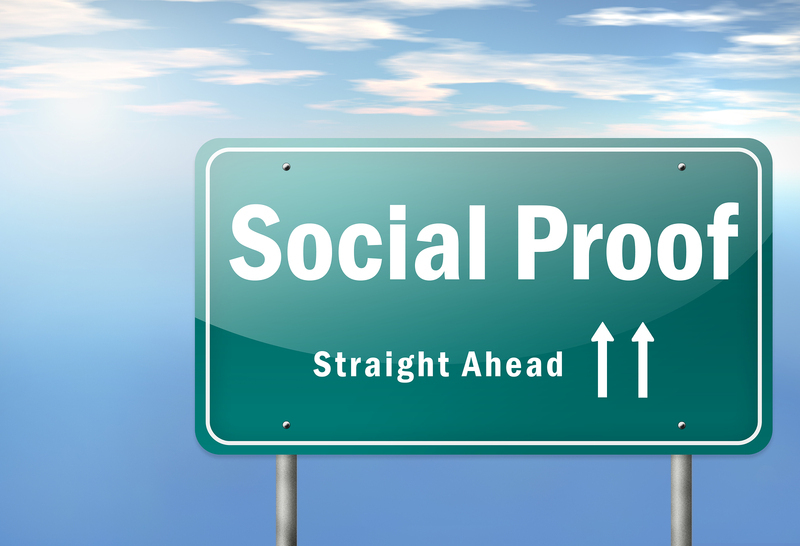 Think of these actions but through online activity, and voila, you have social proof. As companies, we need to be able to offer a similar trust building method that will have a comparable affect to a friend recommending a product. So how do you identify the correct kind of social proof for your consumers and then use it to increase conversions? Without a doubt, social media popularity is one of the best ways to induce a consumer’s trust and increase purchase likelihood. The numbers of fans, followers, mentions and tweets is clear evidence of the popularity of your brand. Let me give you an example, out of the two images below, which company would you put your financial interest in? Clarks, right? Now I realise this is an extreme example, but it goes without saying that being popular on social is key to increasing conversions. As you can see, having their social stats visible may increase the trust when the consumer’s eyes are pointing toward the CTA. On the flip side, if you don’t yet happen to have a large number of followers, do not do this! You don’t want your potential customers seeing your website displaying a follower base of 3, of which one is your mum. It is important to realise the similarity between businesses operating in B2B and B2C markets. If you are targeting businesses, treat them just like a consumer, especially in terms of social proof. Including client logos within either your home, end conversion or landing page is a great way to impress and persuade potential clients that you are worth investing into. If you have clients that are well known in your industry, or likewise are well known all over, make sure you include their logo somewhere visible on your site! You can also include who you work in partnership with somewhere along the page banner. Providing they would be seen as an impressive partner to have, including their logo can sway a client or consumers into investing their time and money into your business. With e-commerce businesses, customer reviews are possibly one of the most important aspects relating to end conversions on your site. According to a study in 2013 conducted by Bright Consumer Survey, 73% of consumers express that positive customer reviews drastically increases their trust for a brand, and 79% of consumers trust online reviews as much as they do personal recommendations. Let’s say you are thinking of buying a new phone, both from not very well established brands that don’t invest heavily into advertising; you have one model on a website with no reviews, and the other model (with similar specs) on a competitor site that has 300 reviews, of which 276 of them are positive, which one would you choose? It has in fact being proven in a study constructed on Bazaarvoice.com that found products with reviews had a 12.5% higher conversion rate, as opposed to those that have none. As well as this, it was found that if these products had more than 20 reviews, the conversion rate was increased by a staggering 83.5%! Written reviews, as we have just established, are a great way to increase the likelihood of a conversion. However, according to Matt Lawson, Head of Conversion at AO.com, customers visiting their site are 120% more likely to make a purchase, they spend 157.2% more time on-page and pay 9.1% more on an order after watching one of their video reviews. Video reviews are without a doubt harder to come by than text. The best way to go about collecting these reviews are by approaching well known vloggers and asking them to review your product. As well as this, for both video and written reviews, you can leave incentives for them to write a statement about your product. Much like an in-store receipt that has a feedback questionnaire with the possible chance of winning £1000, you can send automated emails to existing customers, giving them the chance to win a prize if they leave a review on your site. At the top of the page, Hubspot say “discover companies like yours who have found success with Hubspot”. Already Hubspot have tapped into the personal side of the user, letting them know that companies just like their own have invested into this site, and found success. They then back this up by having a wide selection of case studies below. One of the main things Hubspot have really done well with is the clever layout of their case studies. They have incorporated a photo of each of the clients that have written a case study for them. By doing so, they have just brought the case study to a whole new personal level, as well as proving that they are in fact case studies written by real people. When looking into case studies, don’t forget to include a problem, how your product/service solved it, and what the end result was. With these end results, try and make sure that you are including actual data. For example, if your product/service has increased a client’s sales by X%, get that in there. As well as this, try to publish stories that differ from one another. For example, if you offer PPC as well as social media management, get case studies revolving around both services. You should always aim to get actual customer reviews written specifically for your company, but this means waiting for a purchase and pursuing the customer for a review. Why wait? One thing to do in the meantime is gather relevant information from social channels to further promote on your site. Set up Google Alerts for mentions of your brand, as well as making sure you are never missing mentions using software such as Hootsuite or even pulsar. You can monitor these mentions for positive tweets or comments regarding your brand. Once you have this information, you can embed certain tweets into your site, share blog posts being positive about your brand and even get in touch with the authors, asking them to write testimonials for your website. Your customers are the “be all and end all” of your business. If they have something nice to say about your brand, don’t let this go unused, promote this and others will come. Even negative reviews can be used for good if dealt with in a timely and useful manner. Try it out yourself. Start implementing your own social proof methods and compare them to last month’s conversion statistics; I am sure you won’t be disappointed.